There were some hits and misses on our food crawl, but at the end of the day it was an awesome way to explore Toronto, while indulging in some tasty grub. One of things that my boyfriend and I have in common is our love of food. As a self-proclaimed “foodie” dating someone who enjoys good food and is willing to try new food is really important to me. I might even go as far to say that that would be one of my “deal breakers”. I’ve met people before who have told me “I just eat to sustain myself, I don’t care what it is”. With all that being said, obviously eating good food became a major part of our trip to Toronto. There are so many restaurants in Toronto that I feel like we barely even touched the surface of what Toronto has to offer. According to Zomato there are over 16,100 restaurants in the GTA– that’s a lot of food! Byron’s brother, Arthur, who was also in Toronto for the Bar Call, also happens to be a food lover (he’s actually written a guest post for the blog before) so while we were in Toronto the 3 of us decided to partake in our own informal food crawl. We started at about 1:00 pm and ate, walked and drank our way through the city for the next 7 hours or so. We’d been given many different restaurant recommendations and tried to hit as many as we could, but ended up only making a small dent in our list. Our first stop was at Mean Bao, a quant and cozy (read: tiny) quick service restaurant. Mean Bao specializes in bao, as well as a handful of other dim sum offerings. The menu is concise and all of the food is made fresh to order. We shared 3 different Bao: the Pork Belly with cucumber and hoisin, the Braised Beef with bok choy and taiwanese pickles and the Sloppy Jones with cucumber and green onion. 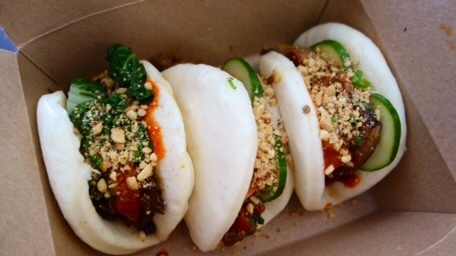 Each bao was delicious in its own way. The silky bao was the perfect vessel for the savoury meats and crunchy vegetables; I loved the way all of the different textures and flavours played together to create something so delightful. 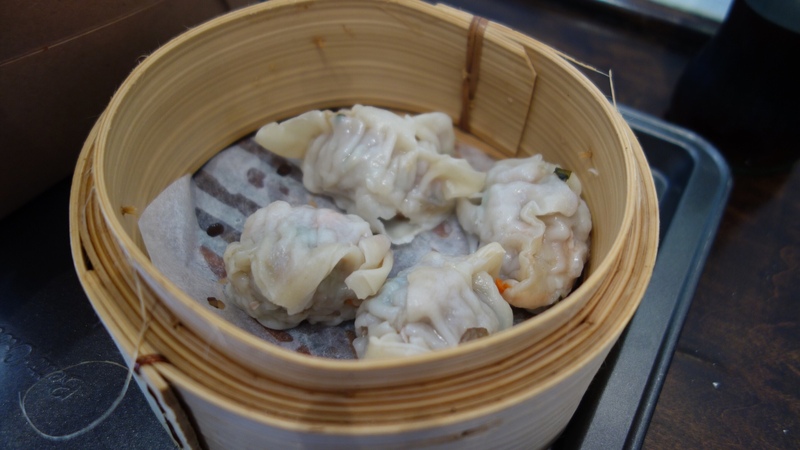 We also shared an order of Pork and Shrimp dumplings, which were very tasty and according to Byron were good, but not the best he’s ever had. 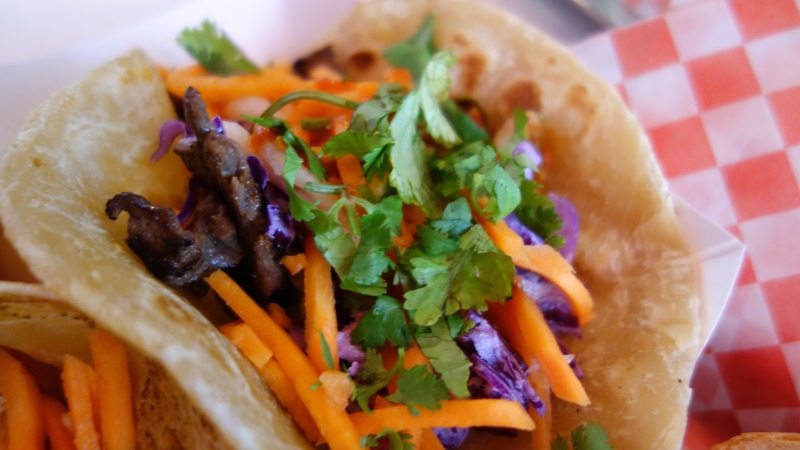 Our next stop was just down the street, Banh Mi Boys, which specializes in Banh Mi, but also serves tacos, bao and handful of other asian fusion items. We decided to try a couple of tacos, the kalbi beef and squid, and a couple of banh mi, grilled chicken and pork belly, between the 3 of us. 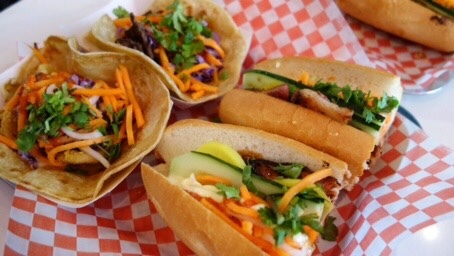 I enjoyed the flavour of the kalbi beef taco and the pork belly banh mi the best. The squid was deep-fried and all I could end up tasting was the deep-fried breading, and while the chicken was good, it just didn’t knock my socks off. 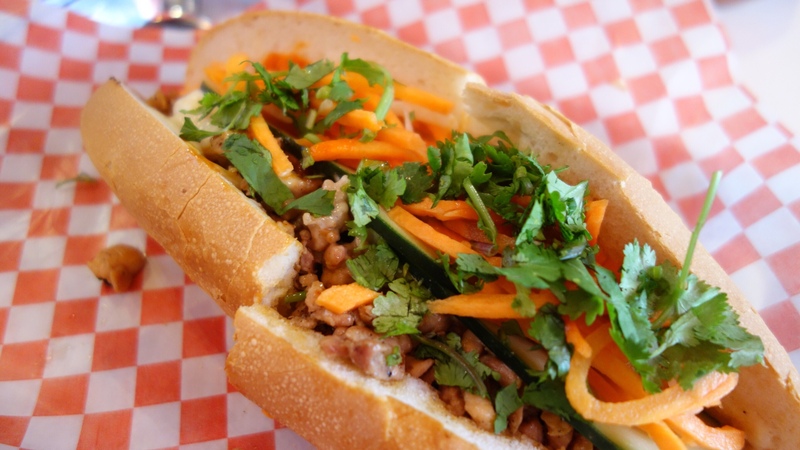 Banh Mi boys has an interesting, modern take on vietnamese subs and I think it would likely be a return destination for a fairly quick, inexpensive, but delicious meal. We ended up at Sin and Redemption kind of randomly. We were walking down Dundas and were looking for somewhere to grab a drink and get out of the sun for a while. Sin and Redemption looked inviting so we headed in for a drink. The large windows opened right up onto the side-walk, so while we were sitting inside and enjoying the comforts of comfy chairs and AC, we also had the benefit of enjoying some fresh air and feeling like we were on a patio. Pretty awesome. People’s Eatery was described as Chinese Jewish fusion, which sounded quite intriguing. We were all pretty pumped to try this restaurant. 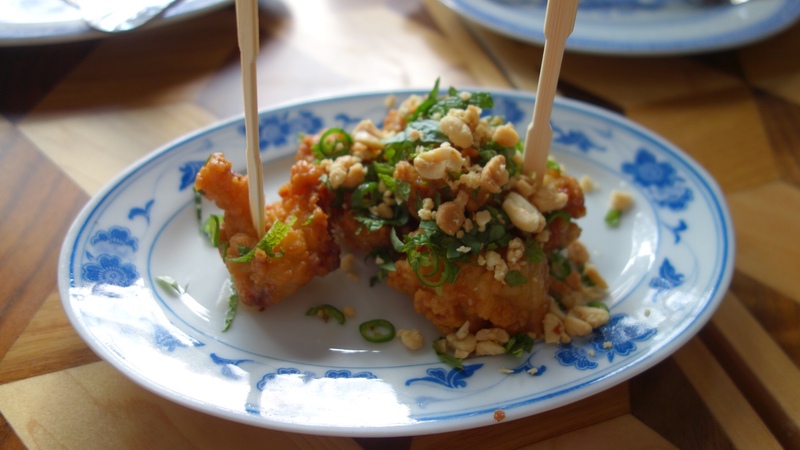 First out was the Thai Fried Chicken with kefir lime, chili and crushed peanuts. The fried chicken was good (when is it not?) but it wasn’t great. I didn’t love the flavour combination of the ingredients on the chicken, it just didn’t work for me. 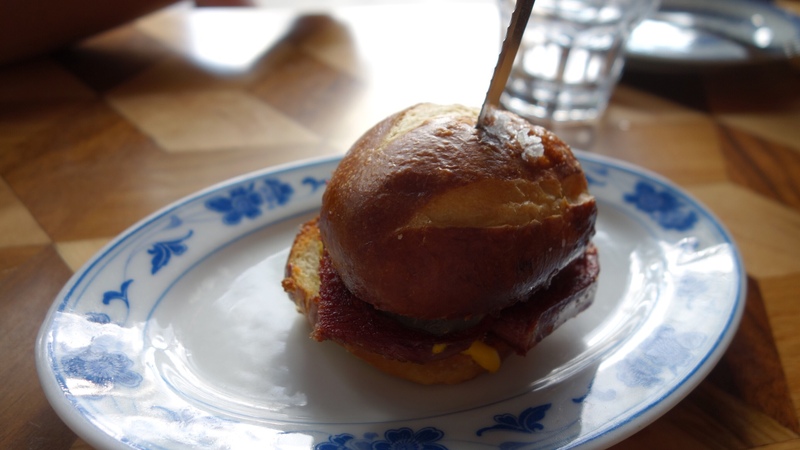 Next out was the Fried Tongue Sandwich served with pickles and French’s mustard on a pretzel bun. I was not a fan of this. I’ve had tongue before and enjoyed it, but usually the meat doesn’t look like an actual slice of tongue. I just couldn’t stomach this. 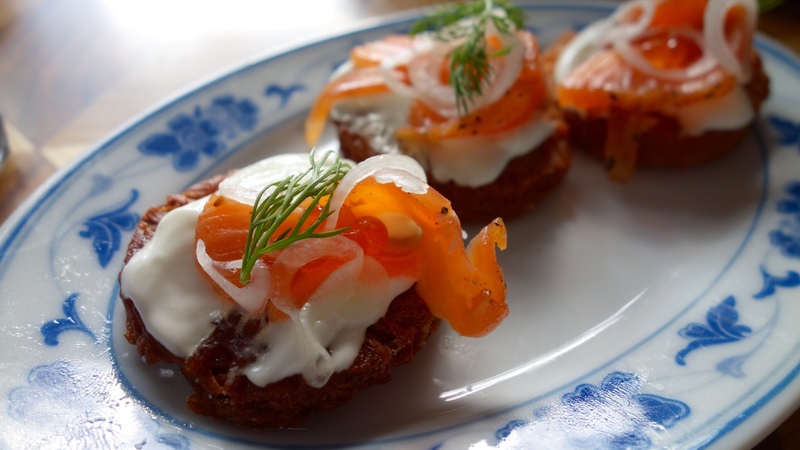 My favourite was the Latke served with trout, sour cream, dill and onion. Fried potatoes are already pretty much the food of the gods, so add some delicious smoked fish and tangy sour cream on top and you have a winner. 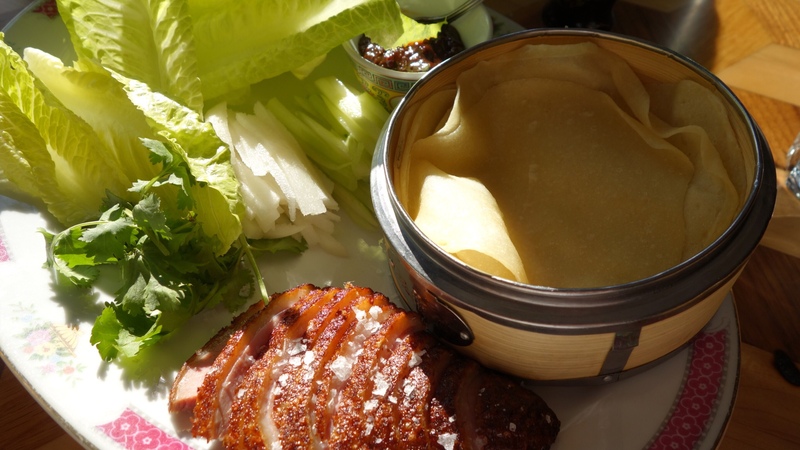 The last item out was the Peking Duck, which included a duck consommé, fried rice with edamame, and of course the roasted duck and pancakes. 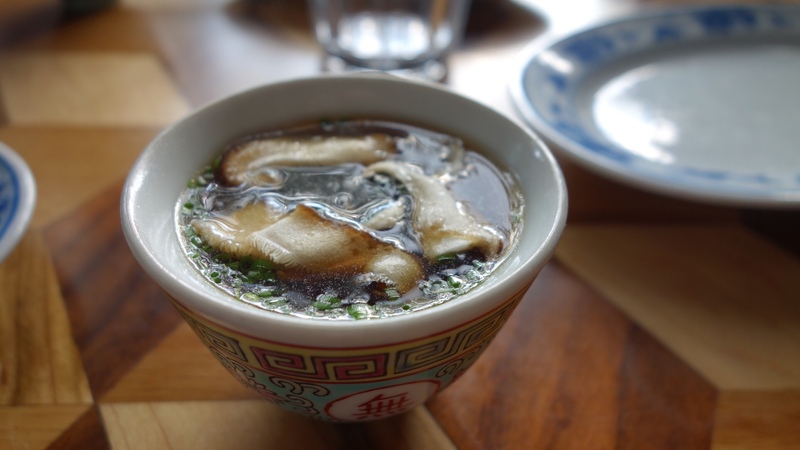 Although I am not a fan of mushrooms, the consommé had a wonderful, rich umami flavour and was quite delicious. 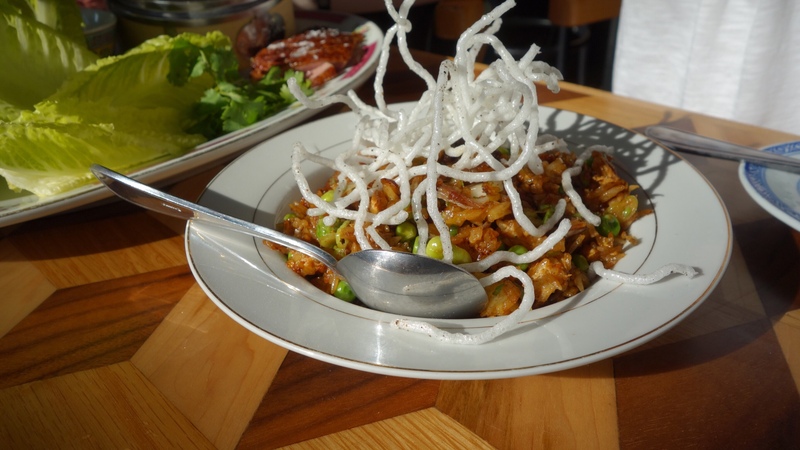 The duck fried rice with edamame was tasty, but nothing overwhelming. The biggest disappointment was the duck and pancakes. Usually this is my favourite part of Peking Duck, however the duck was a little dry and the sauce was just completely overpowering. Fusion can often be really tasty and interesting, but the problem with it is that if it isn’t really well executed, then you are often just wishing for the classic version. We all really liked the innovation and concept of People’s Eatery, but were generally underwhelmed with the food. Our last stop was Bang Bang Ice Cream for dessert. In my opinion ice cream is one of the very best desserts not only because it is so darn delicious, but because there is always room for it, even when you are incredibly full. 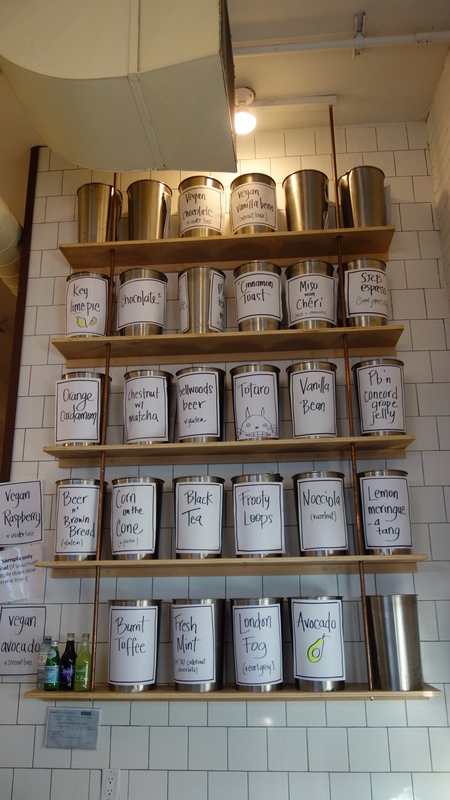 There were a lot of amazing flavours at Bang Bang, but I decided I would opt for the Burnt Toffee. My eyes got a little larger than my stomach when I made the call to go for the full ice cream sandwich. Despite the fact that we had been eating all day, I thought that a full ice cream sandwich, rather than a scoop, or even a half ice cream sandwich, would be a good idea. Don’t get me wrong though, it was amazing. 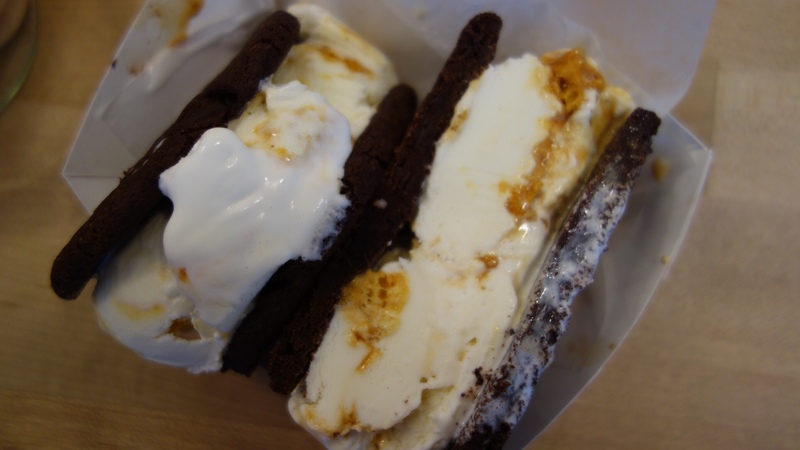 The delicious Burnt Toffee ice cream had wonderful ribbons of sponge toffee throughout it and that played perfectly with 2 dark chocolate cookies that created the sandwich. The dessert was glorious, but it was a huge portion and really, very, very messy to eat. There were some hits and misses on our food crawl, but at the end of the day it was an awesome way to explore Toronto, while indulging in some tasty grub. There are so many restaurants in Toronto so I don’t know if I would make it back to the disappointments, but I can say without any hesitation that I would certainly return to Mean Bao and Bang Bang Ice Cream. As an Alberta girl I was a little sceptical if the food scene in Toronto would live up to all the talk. But, I will admit, I quite liked Toronto. 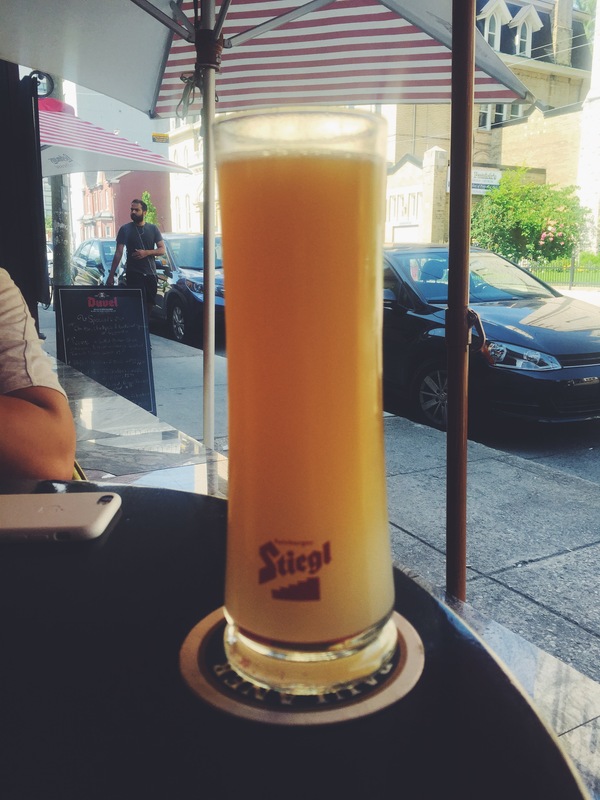 The large, diverse population has resulted in a pretty great restaurant scene and I still have a list about as long as my arm (which is quite long) of restaurants I want to try in Toronto. ’till next time TO. That ice cream sounds fantastic. I want some. 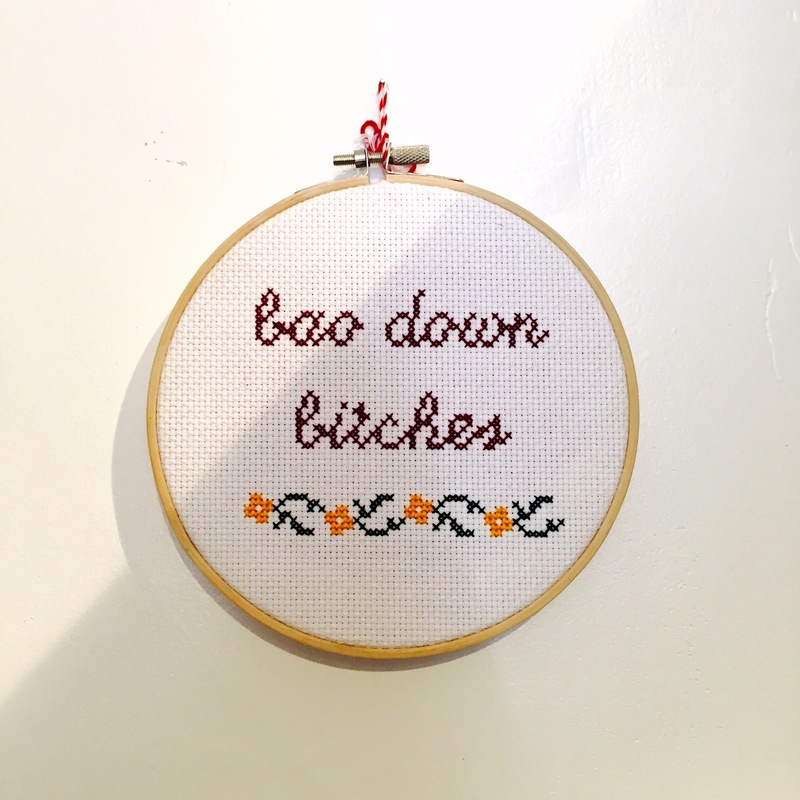 I think we should make some.